Want to learn Chinese fast? This practical, user-friendly, and uniquely visual Mandarin Chinese language course is perfect for busy people. Teach yourself Chinese in just 12 weeks with DK's Complete Language Pack, which includes an easy-to-follow course, a pocket-sized Chinese phrase book, and a guide to the essentials of Chinese grammar. The course book in this comprehensive starter pack is DK's 15 Minute Chinese, which has 12 chapters spanning a range of practical themes, including socializing, business, food and drink, travel, and shopping. Each chapter is broken down into 15-minute lessons, which combine vocabulary and grammar essentials with attractive full-colour photographs. Review modules help you track your progress and identify where you need further practice. 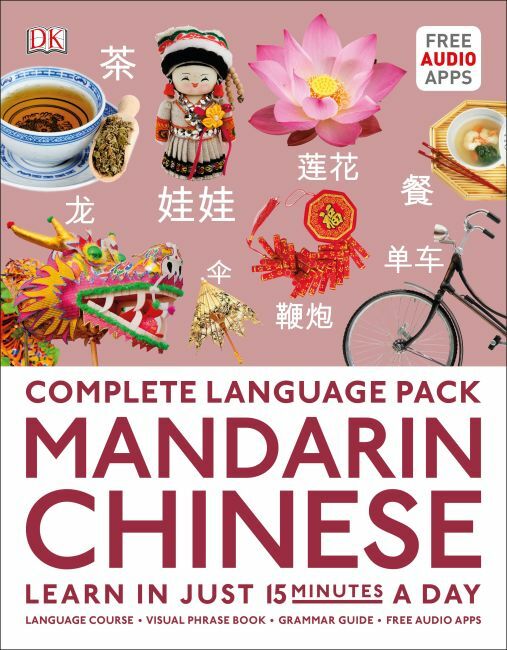 The Complete Language Pack also contains a visual Chinese phrase book - including the essential words and phrases you need to get by in Chinese - and a guide to the basics of Chinese grammar. Two free audio apps (one for the 15 Minute book and one for the phrase book) enable you to hear Chinese words and phrases spoken by native speakers. Use the apps alongside the Language Pack's easy-to-use pronunciation guides to perfect your pronunciation and practise Chinese conversation in real-life situations. Whether you're starting from scratch or want to brush up your Chinese, the Complete Language Pack makes Chinese language learning quick, easy, and fun.